Dentures have been one of the most popular solutions for replacing missing teeth for decades. This guide outlines the different types of dentures, including how much they cost and the advantages and drawbacks of each. We hope this will help you decide what option is best for your situation. The cost of dentures can vary considerably so the figures below are just a guideline. In countries where dentures can legally be made by denturists, the fee guides are typically published by denturist associations. In countries where this service is provided by dentists, fee guides are usually published by dental associations. Some governments provide additional coverage for seniors purchasing dentures. Basic dentures can cost as little as $300 to $500, or from $600 to $1,000 for a full set of upper and lower teeth, making them a cost-effective choice particularly for anyone seeking a temporary solution to tooth loss. These dentures tend to be cold-cured, meaning the acrylic used does not need to be heated in order to be cured, reducing the time required to make the denture. In comparison, mid-range and premium dentures have heat cured acrylic bases that are stronger and more durable. Basic dentures typically use less expensive denture teeth that may look slightly artificial and the denture could have a limited warranty and will not last as long as a more expensive model. 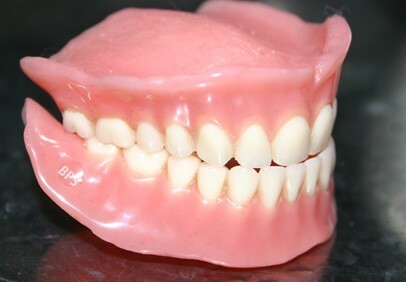 Mid-range dentures can cost between $500 and $1,500 per denture, or between $1,000 and $3,000 for a complete set. Mid-range dentures are more personalized and will include much more natural looking teeth and are more durable than basic dentures. Warranties can range from 90 days to one or two years. In some cases, there will be a money back guarantee and the price quoted may include subsequent adjustments to the dentures. Premium dentures can cost between $2,000 and $4,000 for an upper or lower plate, or from a $4,000 to $8,000 or more for a complete set. These dentures will use the highest quality denture teeth as well as top-quality acrylics to replicate gum tissue. The technician making the denture will spend more time ensuring the acrylic baseplate accurately represents the shape of the gums and teeth are positioned to create an individual and aesthetically pleasing appearance. A premium denture will likely come with a warranty against chipping and cracking, covering the denture for between 5 to 10 years and the price usually includes several follow-up visits to adjust the fit. A removable partial denture starts at around $300 to $500. The average cost ranges from $700 to $1,800. Partial dentures with a metal framework can cost between $2,000 and $4,000 and may include metal clasps or precision attachments that fit onto crowns or bridges to help hold the denture firmly in position. The use of precision attachments does require natural teeth to be crowned, adding to the overall cost of this procedure. Implant supported dentures are typically supported by 2 to 6 dental implants. Treatment may cost from $15,000 and $24,000 or more for an upper or lower implant supported denture, depending on the number of implants required and the type of implants used. For example, mini dental implants are typically much cheaper. Costs also depend on the denture materials used, as sometimes it may be possible to modify an existing denture to fit onto the dental implants. A full set of upper and lower implant supported dentures typically costs between $30,000 and $50,000. Often a dentist will need to remove any badly damaged teeth before making a denture. A straightforward single tooth extraction will cost $75 to $450 while a surgical extraction can cost from $150 to $650. denture is a removable prosthesis that can replace one or more missing teeth, restoring your smile and your ability to eat certain foods. In addition to making eating easier, dentures will help you talk clearly and when multiple teeth are missing provides valuable support for your facial muscles and structures. They are held in place via suction or dental adhesive and can be easily taken out for cleaning and are best removed at night to give the gum tissues a chance to recover. They consist of denture teeth that are normally made from hardwearing plastic, but which may also be made from high quality ceramic. The teeth are supported by a base of gum colored acrylic. Modern denture teeth can closely resemble natural teeth and are available in a huge variety of shapes, sizes and colors. The gum colored acrylic also comes in a number of different colors to create a more natural appearance. Full dentures are useful for patients who have lost all their natural teeth in their upper or low jaw, or both. They help restore the correct facial dimensions and ensure the wearer can eat and speak normally. dentures replace one or more natural teeth and are ideal for anyone who does not wish to have dental implants or a dental bridge. 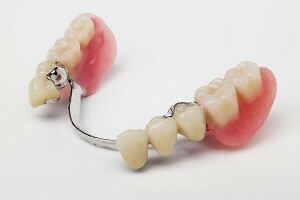 These dentures are removable and are held in place by the natural teeth or with clasps that fit around existing teeth. Precision attachments may also be used to secure partial dentures, where the denture will clip onto an attachment connected to a crown or bridge. Partial dentures are made from acrylic but their base may be strengthened with metal. This is a removable denture that is fabricated several months after the natural teeth have been extracted, once the tissues have finished healing. Immediately after natural teeth are removed, the gums and jawbone undergoes a period of healing where the tissues will change shape. Waiting for these tissues to fully heal helps ensure that conventional dentures will fit properly, with few adjustments required. Immediate dentures are placed as soon as natural teeth are extracted so there is no need to be without teeth during healing. The immediate denture will have been pre-fabricated using models and jaw measurements taken during a previous visit to the dentist. The advantage of an immediate denture is that you will be able to eat relatively normally and to speak more easily. However, the gums and jaw will change shape during the healing process so it may be necessary to have an immediate denture relined or adjusted during this period. Improved appearance. Dentures can help increase self-confidence and self-esteem, replacing missing teeth or teeth that may have been worn or decayed, while providing the correct support for the cheeks and lips. Improved ability to eat and speak. Properly made dentures can help improve speech and enable patients to comfortably eat a greater variety of foods. Affordability. Dentures tend to be the most affordable solution for replacing missing teeth and treatment is the least invasive option. Difficulty eating certain foods.While dentures can restore a person’s ability to eat, certain foods, particularly those that are hard or sticky can still present a problem. Eating these foods could cause pain, may dislodge the dentures or will even risk breaking them. Difficulty speaking. Initially dentures can cause problems with speech. Patients may find their dentures click or whistle. These issues generally disappear once a patient becomes accustomed to wearing their dentures. Discomfort. Dentures can feel very strange initially and although patients may soon get used to them, the overall comfort and fit of this appliance can be an issue. This can remain a problem, particularly as the gums and jawbone will change shape over time, increasing the likelihood of dentures becoming ill-fitting. Care and maintenance. Dentures must be kept meticulously clean to maintain the health of the gums. They can also be quite fragile and if broken must be professionally mended. 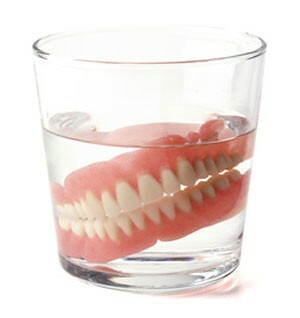 Dentures are quite fragile and will break if dropped so try to handle them over a basin of water or a clean towel. It’s important to remove your denture for daily cleaning. Use a denture brush as this will be softer than an ordinary toothbrush which is too hard and likely to damage your denture. Clean your denture with mild dish soap or a cleanser specifically designed for dentures. Ordinary toothpaste and household cleaners are much too harsh and could scratch the surface of your denture. Don’t try to sterilize your denture with boiling water as the heat could distort it. Once it is clean and while it is not being worn, soak it in a proprietary cleaning solution or in plain water to help keep it fresh and to maintain its shape. Dental bridges are a possible alternative treatment to a partial denture. A bridge is attached to adjacent teeth and it’s important these teeth are strong and healthy enough to support the restoration. Dental implants are self-supporting, using titanium posts that are inserted into the jawbone to hold a crown, bridge or implant supported denture. Both of these options are more expensive than dentures but can offer better aesthetics and a more permanent and stable solution to tooth loss. Considering getting dentures or already have them? Let us know in the comments how much you paid for them and how everything went! My husband was recommended to a the University of MN for denture replacements by a long time friend who was a dentist. We had ones done in 2001 and the teeth wore out, but he could chew, they were comfortable, fit and were excellent. We paid about $1,500 for those back then. We have gone back to the UMN for new dentures and they have been working on them since Oct 2017 and they do not fit, he cannot chew, food gets under them, they changed his appearance, and they are uncomfortable. These cost $5,000 which seems excessive to me. We are still returning in June 2018. Does not seem to be able to make these work somehow. Do some research when choosing something this important to your life. I think I want the mid-range lower dentures. I have Delta Dental Insurance, so I would need to know how much would be out of my pocket. So please contact me asap so we can get started. need to know if snap in dentures is a better product instead of the standard denture top and bottoms. I had an implant placed in Feb 2011 on tooth #14. On labor day of 2014 the cap broke off and the implant Had to be removed. When he removed it the dentist placed cadabra bone. I had to heal for quite sometime. The new implant was placed in August of 2015. The cap was placed on it January of 2016. When he put the cap on he pushed it so hard that I had my sinus drain into my mouth. The new implant created started to burn and I had a lot of discomfort. My tongue turned brown and there was puss on my tonsil. Then my ear started to ring on the left side. I finally had to have the second implant removed in October 2016 but when they removed it they didn’t place any bone graft of gelform. The bottom line is this. I have burning on my gums and my tongue is still discolored. Can they place bone grafting or gelform in the area, even though the tooth was pulled in October? Thank you for this opportunity to discover what lies in my immediate future. It is a scary thing to lose a part of your body that help define WHO you are and one’s self esteem. Your site was informative, I don’t know if I feel better because of that information, but atleast I know!